You know that it’s not safe to take your hands off the wheel to reach for your smartphone, GPS or MP3 player when you’re driving, but you do it anyway! After all, you can’t afford to miss a call or text, and you need to be able to enter directions or change the song when you wish. You’ve likely tried cell phone car mounts in the past only to find them inconvenient or worse, unable to hold your phone. But that doesn’t mean you have to continue to take risks when you’re driving! 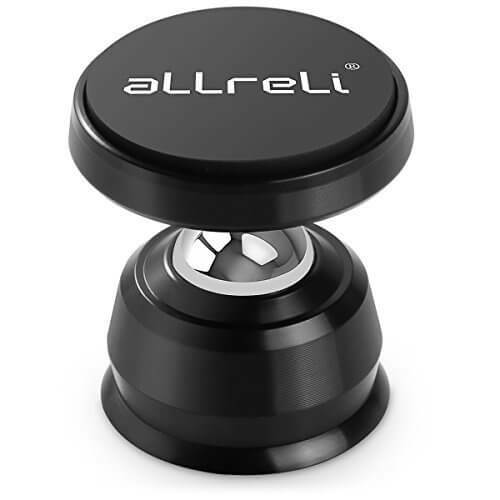 The aLLreLi Magnetic Cell Phone Car Mount Holder Kit will keep your phone clearly visible and completely secure, so your hands can remain on the wheel! With aLLreLi Magnetic Cell Phone Car Holder, mounting your smartphone, GPS or MP3 player in your vehicle is incredibly easy. Just attach the round magnetic mount holder onto a flat surface like the dash or center console. Then, stick your device to the metallic disc. The 360 degree design will let you adjust your phone or other device until you can clearly fit the screen. After you’ve reached your destination, just give your device a gentle pull to remove it. Unlike other magnetic mount holders on Amazon, this Cell Phone Car Mount Kit won’t allow your device to wobble, slip or fall off. Our reinforced magnetic holder keeps a tight grip on devices and has been proven in countless tests to protect mobile phones. The Rotatable Smartphone Holder is a magnetic mount that can be installed on any flat surface that you desire. Keep your smartphone, yourself and your passengers completely safe when on the go with the best Rotatable magnetic mount holder on Amazon! 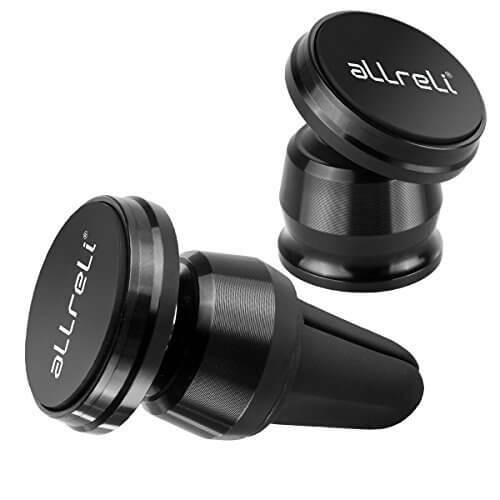 Order the aLLreLi Magnetic Cell Phone Car Mount Holder Kit now. Attention: Please attention due to hot weather, when stick the pad, please use this holder after 24H. very good product,and can be used in a few phones,it is easy to stick rather than some case like a box,it is a very good idea and save more space. Followed the mounting directions and it’s pretty solid. Holds my S7 well. I’ve been using this for months and it’s still firmly attached to my dashboard. Be sure your surface is free of dust and any cleaning fluid or oily residue! Strong magnet holds even a large phone securely. I’m quite impressed with the quality of this product! It sits on my dashboard without blocking any vents or my stereo. Magnets hold phone firmly. The only drawback was the adhesive did not stick to my textured case. I bought a smooth case, problem solved. I have already recommended this product to other family members. Love this! Mounting to the dash, and helps keep hands free while driving. Makes easy use of GPS, and speaker phone. Great for college age kids needing to use GPS regularly, and to keep from fidgeting with phone. Fantastic product of the utmost quality. In my Ford F150 this works well. The only downside is that the device doesn’t protrude far off the dash and therefore if you have a big phone, it will be a little challenging finding a spot to place this for ease of use. Great product though, I couldn’t be happier! The coolest phone mount carrier. The magnet is excellent and holds the your phone with different angles as needed while driving. Awesome quality magnetic phone holder. Magnet strength is perfect not weak and also not too strong. Easily adjusted and works great. You do need to ensure it’s not freezing cold in your car when attaching the ball. The sticky pad works great as long as it’s applied around room temperature. The round metal attachment you stick on the back of your phone keeps coming off. Other than that, when its on its a good product. Love this product! Super strong magnet…wasn’t sure how durable it would be with the weight of my phone (iPhone 8 Plus). Magnet and adhesive both great quality. Fantastic product! So much better than those ones that you need the huge piece on the back of your phone! These won’t erase your cards either if you keep your debit/credit cards plus your phone in your pockets. These mount your phone solidly in place–Iphone 8 plus works great on this. Have two total, love them. Other units dont stick to the dash, this one does. Best magnetic mount I have seen and used. Buy it. This product was so amazing that we purchased one for every vehicle!! Awesome!! This really holds your phone firmly and makes phone access quick and easy. Works great. I waited the 24 hours after sticking it in my car before using it and haven’t had any problem so far. I do wish the range of motion was a little better but really can’t complain. Good deal. Just bought my second one. Super convenient. Wireless charging doesn’t work anymore though, have to take off the case. We have had this in our car for just over a month now. I have a magnetic phone case as it is part of a wallet set so I did not have to worry about putting the magnetic tape on my phone. It is sturdy, and can handle my iPhone 7 and my husband’s iPhone 6+. This was a great buy and we will be purchasing another for our other car. It’s a great little gadget. Comes with a nice box include metal plates, sticker and cleaning paper. The installation is very convenient, and you can adjust the angle as your prefer. Good item. The car mount is good quality and well made. Very firm holding car mount. When I rode over bumping roads, the phone has not drop from the holder. It helps me a lot when I need to use GPS while driving. Sticks well to car dash. Magnet very strong. I had to change my phone case because it was not smooth so the metal piece for phone would not stick. After changing to a smoother case, worked great!